OTTAWA—Heads turn and smiles break out as the four veterans make their way through the Bayshore mall in Ottawa’s west end one recent Tuesday morning. But it isn’t just the men that the shoppers are watching, it’s also their dogs. A little-noticed promise in the most recent federal budget has sparked applause and sighs of relief from veterans across Canada dealing with post-traumatic stress disorder and other psychological trauma. The commitment was to add “psychiatric service dogs” to the list of medical items that Canadians can claim as a tax credit on income-tax forms, as is already the case with guide dogs for the blind. The move follows the recent results of a government-commissioned study that indicated—as many veterans and advocacy groups had long claimed—that dogs can go a long way in helping those suffering from invisible injuries. “He lowers my anxiety. He gets me out of the house,” says Dwayne Sawyer of his service dog, a golden Labrador named Rex that has been helping the 22-year veteran with his PTSD. Rex sits at Sawyer’s feet as shoppers walk by. Yet the answer to one big question is still being worked on: What, precisely, qualifies as a psychiatric service dog? The idea of using service dogs to treat and support veterans and others suffering from PTSD has been around for a few years but was largely disregarded by the federal government until May 2014. That is when then-veterans affairs minister Julian Fantino pledged up to $500,000 for a 2.5-year study to assess the benefits—and risks—of such dogs, with an eye to whether their use should be encouraged and expanded. 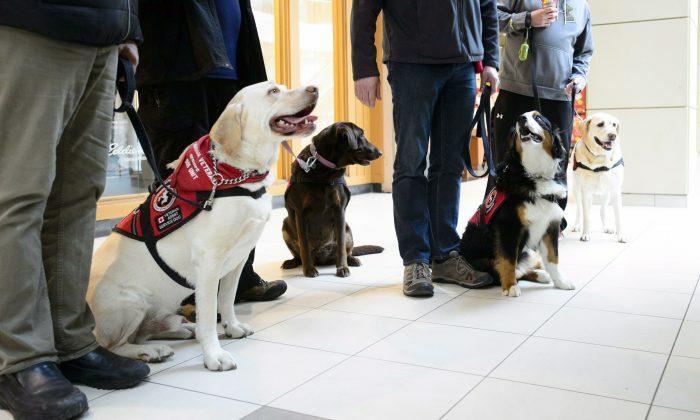 Documents obtained by The Canadian Press show the study was delayed because of “recruitment and retention issues of both trained psychiatric service dogs and veterans,” but a preliminary report was recently published. The findings: Three months after they were obtained, service dogs were found to have “some positive effects” on veterans’ ability to sleep as well as to manage their PTSD and depression. A final report is expected this summer, but the Trudeau government opted not to wait and instead promised in last month’s budget to expand the medical expense tax credit to include psychiatric service dogs. “The efficacy study has still not been concluded, but it looks really good and enough veterans have told us what a difference this makes to them,” Veterans Affairs Minister Seamus O’Regan said in an interview. But there was another thing the government decided it didn’t need to wait for, even though veterans and trainers are the first to say it will pose a challenge: developing a national standard for the service dogs. That effort, which covers all types of service canines including guide dogs and those for children with autism, has been in the works almost three years—and proven controversial and divisive. The concern is that dogs that aren’t properly trained will misbehave in public, including jumping at people or otherwise disrupting businesses and making it more difficult for legitimate owners to be accepted. “You’ve got dogs coming in that aren’t necessarily safe,” said Danielle Forbes, executive director of National Service Dogs in Cambridge, Ont., which is accredited by Assistance Dogs International. There is also the fear that fake breeders will take advantage of veterans and others, who can expect to shell out thousands of dollars for a trained service dog unless they are lucky enough to be supported by a local organization. Alberta and British Columbia have adopted their own standards, which a dog must meet before those provinces issue a card that lets owners take the service animal into businesses and other places. The federal government has been working on a national service-dog standard for nearly three years, but it has so far failed to come up with an acceptable framework. A first draft released by the Canadian General Standards Board was greeted with anger and frustration from various segments of the community, but especially guide-dog users and the schools that train them. They argued the proposed rules would force schools to either change their time-tested training programs or possibly stop serving Canadian students altogether. Others felt the draft was too broad and tried to do too many things. “Each organization, let’s say the service dog for epilepsy, they want their own thing. 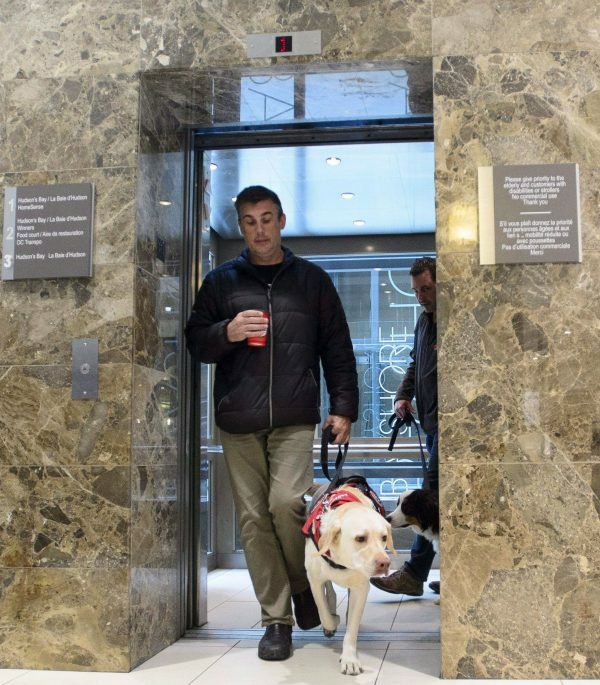 The service dogs for the blind, they want their own thing,” said Serge Lemieux, vice-president of the Canadian Veteran Service Dog Unit (CVSDU), a charitable organization based in Ottawa. A second draft has been developed and consultations are planned for this summer, and most are hoping for a better result this time around, especially given the need; Lemieux said his organization has 40 veterans waiting for a dog. Sawyer is only too happy to have found Rex through the CVSDU. And he hopes the government’s plan to give tax credits for such dogs makes them more accessible to other veterans in need.